Many strange sights greeted Columbus and his men as they explored the New World in the fall of 1492. Certainly they did not anticipate that Europe would adopt any Amerindian customs. 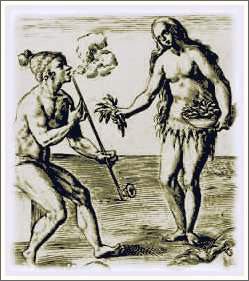 With a single line in his journal, Columbus described a group of Taino natives smoking rolled tobacco as they rested in the woods near Cuba’s Bahia Bariay harbor that November: “The Spaniards upon their journey met with great multitudes of people, men and women with firebrands in their hands and herbs to smoke after their custom.” Columbus, convinced about great riches in the New World, pursued only dreams of gold. The explorer did not realize that Europe would soon fall under the spell of tobacco and the rest of the world would follow suit. In fact, Europeans embraced tobacco before many other common products including sugar, chocolate, coffee and tea. Columbus could not have imagined tobacco’s already long and complex history from his first brief glimpse of the Taino smoking. Amerindians cultivated tobacco across both American continents, and even societies that grew nothing else still grew tobacco. A privileged plant, tobacco was often separated from other crops in elaborate, reserved gardens. A wide array of tribes employed tobacco for symbolic and medicinal purposes, as part of a hallucinogenic mix of plants in shamanistic or religious rituals, and just for social occasions. The Yecuana of Venezuela told a Genesis-like story in which women were formed from clay that came to life when tobacco smoke passed over its surface. Carved monuments depicted Mayan deities as smokers. The Iroquois of New York used tobacco as a dental remedy because it anaesthetized the pain of tooth decay. After dinner, smoking tobacco was a common practice among the upper Aztec classes. Columbus received tobacco leaves, along with other gifts from Amerindians. But history credits no single person with introducing the practice of smoking to Europe. There is a story that one of Columbus’ men, Rodrigo de Xeres, demonstrated the custom to his neighbors in Spain. Frightened to see him exhaling thick clouds from his mouth and nose, they handed him over to the Inquisition, claiming that he had made a bargain with the Devil. Amerindians introduced tobacco to other European explorers, sailors and settlers - but the plant would never have made the jump to European culture without the help of physicians. They seized upon the notion that many Amerindian cultures valued tobacco as a powerful healing agent. They did not share the Amerindian belief in the supernatural character of illness, but Europeans were eager to discover new plants from the New World with healing properties. In their zeal for finding herbal remedies, these doctors did not realize that they were promoting a major source of disease. More than any other physician, the Spanish doctor Nicolas Monardes holds the dubious distinction of establishing tobacco’s reputation as a plant with remarkable capabilities. In his immensely popular history of the medicinal plants of the New World, published in 1571, Monardes claimed that tobacco cured more than 20 ailments, including cancer. Imagine that as your legacy to the medical community! The French ambassador Jean Nicot was another champion, and one of the world’s most addictive substances -nicotine - was named after him. Tobacco was traded in Asia by 1575 and then moved to the rest of the world over the next 50 years. Portuguese, Spanish and, to a lesser extent, English merchant ships carried tobacco from American colonies to the Near East, Far East and Africa. From India, tobacco moved to Ceylon in the early 1600s, according Jordan Goodman in “Tobacco in History,” and simultaneously spread from China to central Asia, Eastern Europe, Mongolia and Tibet. Cultivated tobacco could be found in Indochina and Taiwan by 1630. Thus tobacco completed its circumnavigation of the globe as a cash crop. In most locales, tobacco was introduced as a medicinal herb. N. tabacum, the basic species of the tobacco plant, is adaptable to many soil and climate conditions. 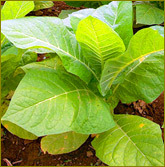 Tobacco does best in a warm, stable climate, growing in light soil, both drained, and heavily fertilized. The leaf varies greatly from region to region offering different tastes and flavors. The modern tobacco industry began in the US in the late 19th century with the industrial revolution and a combination of innovations - flue-cured tobacco, safety matches and James Brosnack’s cigarette machine, invented in 1880. There actually would be no cigarettes as we know them if chance hadn’t intervened. Flue-curing - a heat-drying process - was accidentally discovered by a slave after a fire on a North Carolina plantation, and it yielded a mild taste smokers found more pleasurable than that of bitter dark tobacco. Flue-cured tobacco produced acidic smoke, easier to inhale than the alkaline smoke associated with air- or fire-cured tobacco. Brosnack’s cigarette machine mechanized the rolling process, pushing loose tobacco onto a moving belt, compressing it, and then wrapping it in a paper tube that was glued and cut into a finished cigarette. One machine could accomplish the labor of 48 workers. From the start, cigarette manufacturers were master salesmen, although their product is so addictive some claim it sells itself. They employed sophisticated advertising campaigns, giving rise to modern major tobacco companies and making the cigarette a 20th-century icon of consumer culture. Early cigarette promotions linked the product to figures whose opinions and taste were thought to be influential - singers, actresses, presidents and royalty. One marketing strategy associated cigarettes with personages of respectability; another used images of women to arouse interest. Even as the Marlboro Man became one of the most successful international campaigns in the history of advertising, the image of cigarettes and smoking transformed in the US and Europe after a 1964 US Surgeon General’s report confirming the link between smoking and lung cancer. In the 1960s, 50 percent of men in the US smoked. By 2003, that number was reduced to 25 percent. Today it would be unseemly if major figures comparable to Winston Churchill, General Douglas MacArthur and Sigmund Freud were so overt in their affection for tobacco. The story of tobacco has come full-circle, from miracle cure to dangerous addiction. In many developing nations, over 60 percent of men currently smoke. Globally, the proportion of women smokers has trailed men, but is increasing. A major health tragedy could occur in the developing world within the next 30 years, even as governments of developed nations enact laws to protect their citizens against tobacco addiction and its toll on human life.